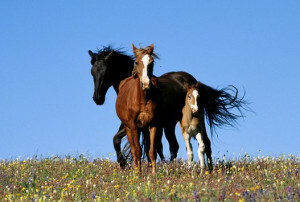 Bio-Mos® benefits mare nutrition and healthy foals by stabilizing the gastrointestinal tract. 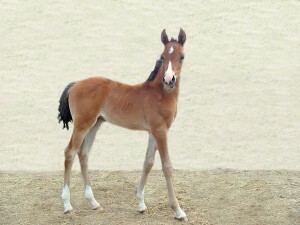 This is essential for the mare to ensure the proper transfer of nutrients to the unborn foal. The scavenging action of Bio-Mos on harmful bacteria present in the digestive system, combined with the stimulation of the immune system through the increase of serum immunoglobulins, effectively prepares the mare for this crucial physiological stage. In addition, eliminating harmful bacteria from the gut of the mare has the added advantage of ‘sanitizing’ the immediate environment of pathogens that are a potential threat to, and great contributor to diarrhea and digestive upsets in the newborn foal. Research suggests that Bio-Mos subsequently promotes the enhanced transfer of antibodies to the mare’s milk, providing the suckling foal with the passive immunity needed to face environmental challenges when its own immune system is not yet fully competent. This action is of specific importance when considering the foal, as little or no maternal antibodies are passed through the equine placenta before birth. On-farm trials have seen drastic reductions in the incidence of foal diarrhea when mares are supplemented with Bio-Mos during the last months of pregnancy and early lactation. Directly supplementing the foal with Bio-Mos further ensures the proper development of the digestive tract flora as the transition is made from milk to solid feeds, ensuring optimal and healthy growth and development. Bio-Mos is effective in eliciting positive responses in all horses. Whether we are considering the health of the broodmare and foal, helping the competition horse cope with work stress, boosting the immune system post illness, or simply want to ensure the day to day well-being of the pleasure horse, Bio-Mos is the first line of defense – naturally.